Television’s most relaxed chef’s Simon King and David Myers are getting on their bikes for a new adventure their first live show! 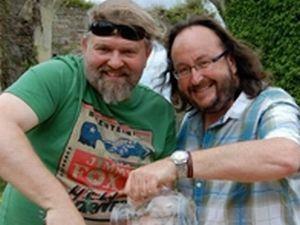 Reminiscing about their trips diving into photo albums and preparing a 3 course meal in 15 minutes!Join The Hairy Bikers for an evening of cooking chatting and laughs. Stars of BBC2’s ‘The Hairy Bikers Cookbook’ ‘The Hairy Bikers Ride Again’ ‘The Hairy Bikers Come Home’ and ‘The Hairy Bakers’ which was watched by more than 4 million viewers.2009 and 2010 have been busy for The Bikers’ with a giant 30 part series on BBC2 called ‘The Hairy Bikers’ Food Tour of Britain’ and most recently ‘Mum Knows Best’ and now the Bikers are embarking upon their national tour bikes and pans at the ready!